Are you tired of people asking, “Where are you from?” Have people said, “Welcome to the US” even though you have lived here for over ten years? Are you often asked to repeat yourself? Do you feel that others are distracted by the way that you speak and therefore are not listening to what you are saying? If the answer to any of these questions is “yes”, you can benefit from the expertise of a Speech Pathologist/Dialect Coach. When most non-native speakers attempt to speak Standard American English, they do so by using the sounds and intonation patterns which are familiar to them in their native language. They substitute the unfamiliar or difficult sounds in English with sounds from their primary language. This results in a communication style that sounds “accented” to native speakers of the language and often leads to communication problems. Accent modification classes will help to improve your speech and reduce your foreign accent. Sound by sound, you will learn how to speak without an accent. A phonetic analysis of your non-native accent by a licensed Speech Pathologist/Dialect Coach will help you understand the differences between your pronunciation and that of Standard American English. Through a specifically designed program of ear training , you will learn the placement of your articulators – your lips, your teeth and your tongue– to facilitate easy production of your new sounds. You will practice the new sounds in words and sentences. As your Speech Pathologist/Dialect Coach works on accent reduction with you, you will be provided with immediate feedback and correction, so that you can gain confidence and consistency in producing your new sounds. Structured conversational speech will also be incorporated into the session, so that you learn to self-correct and to assimilate the newly acquired speech skills into your everyday conversation. Finally, the frustration of communication will be replaced with the ability to communicate clearly, precisely, and confidently. At Sankin Speech Improvement, we have extensive experience working on accent improvement and modification for non-native speakers from around the world. 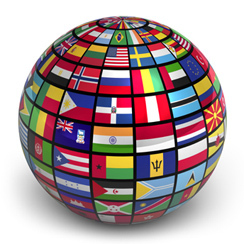 Clients have come from countries such as Canada, England, France, Italy, Spain, Portugal, Belgium, Germany, Czech Republic, Ukraine, Russia, Croatia, Thailand, Japan, China, Thailand, Mexico, Brazil, Columbia, Argentina, Australia, New Zealand, Israel, Greece, South Africa, and Haiti. If you are outside of the NYC area, accent modification classes are available via remote Skype sessions. Let us help you eliminate your accent now! Call Susan now at (917) 733-3534 to make an appointment.